Language is at the intersection of culture, identity, politics, and cognition, and lies at the centre of our distinct and shared humanity. What will future language use—particularly in Indigenous contexts—mean for us and for our communities? Among the many important stories about Indigenous language loss, there are also powerful and affirming stories of revitalization, resurgence, and recovery. Future Speakers highlights both the struggles and the successes of Indigenous language revitalization and looks to a future where these languages are not only spoken, but thrive. Leanne Hinton: What counts as “success” in language revitalization? Leanne Hinton: What counts as a “success” in language revitalization? October 29th, 2015 by allancho | Comments Off on Leanne Hinton: What counts as a “success” in language revitalization? Posted in community engagement, Events, Literature and Language, Programs, Webcasts | Comments Off on Leanne Hinton: What counts as a “success” in language revitalization? Xwi7xwa Library is closed this morning, Thursday, October 29, due to an unexpected power outage. UBC Plant Ops is working to resolve the situation, but it is unknown when power will resume. Exploring Open Collections: What Can You Find? October 28th, 2015 by alexandra kuskowski | Comments Off on Exploring Open Collections: What Can You Find? Posted in announcement, digitization, Digitizers' Blog, Exploring Open Collections, Open Collections | Comments Off on Exploring Open Collections: What Can You Find? Free ICPSR Summer Program workshop: “China Multigenerational Panel Datasets”! October 28th, 2015 by Kelly Schultz | Comments Off on Free ICPSR Summer Program workshop: “China Multigenerational Panel Datasets”! Posted in data, News | Comments Off on Free ICPSR Summer Program workshop: “China Multigenerational Panel Datasets”! The UBC Okanagan Innovation Library, which opened earlier this month, is a partnership between Okanagan Regional Library (ORL) and UBC Okanagan Library. An official reception was held October 15 to formally recognize the space. The new branch is located within the ORL’s Downtown Kelowna branch, and provides library services and resources to UBC faculty, staff, students and alumni, as well as community members. Deborah Buszard, UBC Deputy Vice-Chancellor and Principal of the Okanagan campus, Stephanie Hall, ORL executive director, as well as Heather Berringer, Chief Librarian, were on hand to welcome guests and provide remarks on the impact of the space to users. 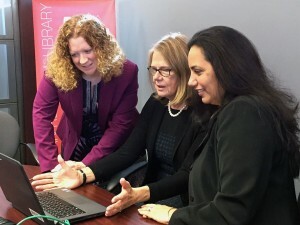 “The Innovation Library is the product of a partnership that is unique in Canada and offers a new model for university libraries of the 21st century,” said Buszard. The event was featured on Global Okanagan, “News at 5, Top Stories” (begins at the 11:48 minute mark).